The web is full of lame career advice for musicians. It can be hard to cut through the noise and find any useful guidance. Do we really need another “10 tips for branding your band on social networks”? We know how to post to Facebook. Most musicians have only a vague idea of how to make money from our music. We spend the day as graphic designers, contractors, teachers and telemarketers. We are professional in our craft, but our bank accounts have little to show for it. We’re not in it for the money, we play music because we have to. We have to express ourselves and connect people together. Yet most of us are in the dark when it comes to earning a career from our musical pursuits. Let’s be honest with ourselves. For decades we’ve been told to focus our energy on making great music and being in the right place at the right time to be “discovered”. Just be special, they said. If you build the hits, the fans will come. No wonder ours is a generation full of failed and exploited professional musicians. No one ever taught us how to do business. There are millions of people playing music across the world at this very moment. Hundreds of millions more are listening to music. And billions of dollars are being made. The ones making the money are treating their music as a business. It begins by realizing you’re not just a musician, you’re an entrepreneur managing a small business. It’s really uncool to say, but the consolation prize is getting to do what you love for the rest of your life. John Snyder, founder of Artists House Music. These walls are already coming down thanks to the ways the web enables direct fan patronage on crowd funding platforms like Kickstarter, but they’re coming down too slowly. We need organizations like Artists House Music to push musician entrepreneurship forward, to provide expert knowledge and wisdom as a public service. We need a culture of entrepreneurship in music, and it won’t happen without the kind of leadership groups like Artists House Music provide. The organization fulfills its charter first and foremost by providing a very active Livestream channel full of music conferences, concerts and other events, which are archived along with tons of other great videos on their YouTube channel. Any musician that happens across this encyclopedic treasure trove of industry wisdom is sure to click subscribe and suddenly lose hours or days within its archives. For example, just the other day I started by demystifying publishing and licensing and got re-introduced to how musicians earn money by selling rights to use their music. Then I got a second and third opinion. I’ll be going back for a fourth and fifth because every topic is covered in exhaustive detail. 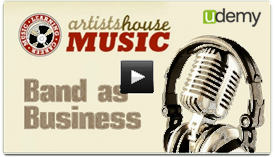 It’s easy to emerge with a comprehension of complicated music business basics before you even realize it. When you’re done with the beginner stuff, you can dig in to controversial industry topics like the termination of sound recording copyrights or go behind the scenes at a modern-day artist management company. And these videos only scratch the surface of the massive Artists House Music website which features everything from musician strategy to legal guidance. 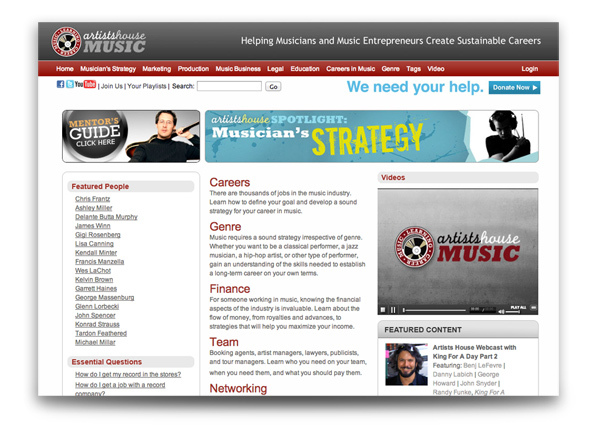 The sheer amount of resources for the musician/entrepreneur is staggering. Regrettably, I am not only writing this on occasion of the non-profit’s demonstrated utility to musicians at large. if you’ve been clicking through to the amazing links, you’ve probably noticed Artists House Music’s grant funding has run out. They need our support to continue to provide this invaluable content. I wouldn’t be doing my part if I didn’t urge you to drop some coin their bucket to keep the good work moving forward. We are clearly moving toward a new business model for music. It’s more sustainable and equitable than ever before. Now anyone can start a band, record and release a hit album in their basement overnight. It’s happening more and more. There are more opportunities — and more competition — than ever before. You don’t just have to work harder, you have to work smarter. Often success is as simple as setting your mind to achieving it. If you’re motivated to learn about the opportunities for you to make money playing music, start at Artists House Music.